The Cuisinart Ceramic Cookware is one of the stylish cookware set that can be liked by everyone. This ceramic coated cooking pots are safe and healthy to use for your family. They are free to form any kind of harmful chemical and materials and good in low-fat cooking. You can use them in every cooking top even for oven too. This two toned red and the white ceramic set is also quite durable and give professional results while making. Different type of recipes. In addition, you will get ten pieces of all necessary cooking pots in this Cuisinart ceramic cookware at an affordable price. Both professional or amateur chef will find them really useful for their everyday meal preparation. In this Cuisinart ceramic cookware review, you will know how this cookware set is different from others. This set is free from any harmful chemical or material that can cause toxic fume and can mix into food. Usually, cookware coated with Teflon, cadmium or contain with any petroleum is very toxic in the long or short term usage. They can cause cancer and other deadly diseases. In that case, Cuisinart ceramic cookware is very safe to use for everyday cooking. 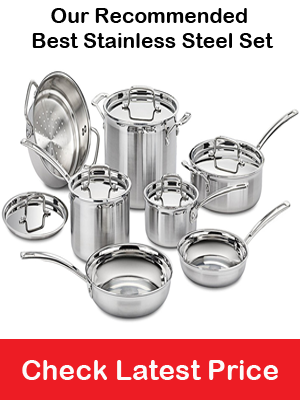 There are some other features that you should know properly to understand about this particular type of cookware set. Have a look below. One Saucepan with lids- 1.5 Qt. One Saucepan with lids – 2.5 Qt. One Saute Pan with lids – 3 Qt. One Stockpot with lids – 8 Qt. All these post and pans have the silicone handles which are heat resistant and comfortable to use. Moreover, these pots have the convenient shatter proof glass lids which allow easy food monitoring without losing the moisture and heat. You can cook them low to medium temperature according to the manufacturer’s instruction, but it takes while to cook at low temperature. So, we suggest that you should cook foods on medium heat by covering the lids. It will save your time and cook perfectly. Don’t use a high flame to cook with them. It will burn your food early and also damage the pots. However, you can use these cooking pots in the oven in up to 350F. This ultimate ceramic cookware set is quite handy. They are light to use quickly but not too flimsy like other cheap nonstick cooking pots. Also, they have all the necessary pots in different size so you can make a medium or large meal at a time. It’s silicone handle rests the heat spreading all over the handle while cooking. So you may use oven mitt or clothes to hold the halves, but when you are using it, over do use oven mitts. However, if you use them with your silicone, wooden or bamboo utensils rather metal, the coating will last for a long time. The Cuisinart ceramic cookware is also easy to clean. You can clean them by your hand rather than a dishwasher. They are dishwasher safe. So use your regular scrubbing method to wash them off. If anything burns and stick with pots soak them in warm water for few minutes and gently scrub them with your dishwashing soap and sponge. Completely petroleum PTFE and PFOA free. Convenient tempered glass cover for easy monitoring. In this Cuisinart ceramic cookware review, now we are going discuss some alternative cookware set that you may like. All the are similar to our current review product sometimes even more. They are cheap in price and also durable. First of all, we are going to talk about the COOKSMARK Pearl Hard Porcelain Enamel Nonstick Cookware Set. This is stylish cookware that may want in any posh kitchen. It’s speckled porcelain enamel outside is very exquisite and also long durable. its stain and fade resistant so even after few years of use the enamel will stay same. However, you can use them in the dishwasher or use in your gas, electric and halogen oven.it has the super nonstick coating, Maxlon which allow your foods to slide off easily. It has the thick aluminum bottom which is ideal for equal heat distribution. These pots are also dent resistant. Our next cookware set is a famous brand. The Rachael Ray 14-Piece Hard Enamel Nonstick Cookware Set. This set is also made of aluminum and get stylish vivid color (red, blue and orange) of the exterior. With all the necessary cooking pans and pots it comes with three different type of utensils, carbon steel baking sheet, etc. this two toned exterior can make a bold statement into your kitchen. However, it has the comfortable silicone grip handle and shatters resistant glass cover. Both of the product is great in quality and comes with the affordable price. So after the Cuisinart, you can trust all these two brands for sure. Q- Where the cooking set made from? A- They are made in China. Q- Does they need to be seasoned before cooking? Q- Are they suitable to use with metal utensils? A- It’s better to cook them with wooden or bamboo utensils. This attractive piece of the cooking set will make surely complement your kitchen and dining. This excellent design and color are ready to serve meal directly from the pan to plate in any occasion if you like. However, you will need bit carefully when cleaning these pots of use of utensils. Don’t use metal utensils or wash them in your dishwasher like other pots. If you could beat, consider this Cuisinart Ceramic Cookware Set that will surely last for many years without giving any trouble.